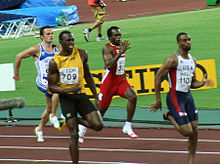 Running is a means of terrestrial locomotion allowing humans and other animals to move rapidly on foot. It is simply defined in athletics terms as a gait in which at regular points during the running cycle both feet are off the ground, in contrast to walking, where one foot is always in contact with the ground. Ancestors of mankind developed the ability to run for long distances about four and a half million years ago, probably in order to hunt animals. Competitive running grew out of religious festivals in various areas. Run! Run, like the devil's behind us. Run, to where no one can find us. Be my compass. Lewis Carroll, Through the Looking-Glass, chapter 2.—Logical Nonsense: The Works of Lewis Carroll, ed. Philip C. Blackburn and Lionel White, p. 177 (1934). First published in 1872. When you run with the Doctor, it feels like it'll never end, but however hard you try you can't run forever. Forest of the Dead [4.9] (June 7, 2008). All day he ran. He did not rest. He seemed made to run on forever. His iron-like body ignored fatigue. And even after fatigue came, his heritage of endurance braced him to endless endeavour, and enabled him to drive his complaining body onward. Jack London, White Fang (1905). He can run. But he can't hide. Joe Louis, remark to a reporter prior to the Joe Louis—Billy Conn boxing match (June 19, 1946); reported in Louis, My Life Story (1947), p. 176.